One of the pleasures of alighting from the Overground at Hackney Wick station is the whiff of bagel. Beyond the foot of the ramp on the corner of White Post Lane are the premises of Mr Bagels, a fully automated £3m facility opened in 2003, pumping out steam-baked dough rings for the benefit of major retailers and catering companies. But no longer. I walked out of the Overground yesterday to see a large knocked-down space behind blue hoardings, now almost entirely rubble apart from a couple of wall-less rooms awaiting the chop. 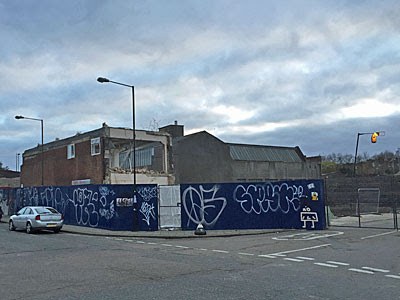 The boys from Havering Demolition Ltd have been hard at work, probably for some time, and have succeeded in levelling the former bagel factory to the ground. It's going to become flats, obviously. And it's not alone. Over the next few years the site at 52-54 White Post Lane will become "a mixed use sustainable development of 2330m² of flexible and high quality employment spaces aimed at creative industries with 55 residential units above". Specifically that's seven employment spaces to retain job provision on site, with 13 affordable and 42 non-affordable apartments perched above. It's very much the modern approach, making good use of space by stacking flats on top of commercial units, then submitting planning applications full of generically upbeat phrases. No building here is due to rise higher than six storeys, so the development won't be overly intrusive, but neither will it be interesting. It's more of this, I'm afraid. ADDRESSING THE AREA’S INDUSTRIAL HERITAGE. OUR APPROACH HAS BEEN TO CREATE SIMPLE AND ROBUST ELEVATIONS, WITH A RHYTHM INSPIRED BY FISH ISLAND’S INDUSTRIAL HERITAGE. REGARDING THE ELEVATIONAL TREATMENT, OUR APPROACH WILL BE TO USE SUBTLE CHANGES OF DEPTH TO CREATE A DYNAMIC AND MODERN LOOK. I often wonder why we still teach English Literature to children, when what they should instead be studying is a GCSE in Marketing. The ability to make something ordinary sound amazing is key to success in 21st century Britain, and nowhere is this more evident than in the descriptive world of property development. The estates team have been hard at work here crafting glossy verbal sheen, rarely less meaningful than in their claim that the "elevational treatment" will range "from rigid grids to playful windows". What these weasel words really mean is that this development will look pretty much the same as the typical brick vernacular now springing up across the capital, so nothing special, and indeed pretty much the same as the even larger development pencilled in nextdoor. This is 24-26 White Post Lane, another brick cluster on similarly brownfield land. Allegedly the architecture "takes inspiration from the existing area where creative industries and residents live side-by-side in the converted warehouses and factories left over from the Victorian industrial buildings", but in fact it looks exactly like everything else going up everywhere else at the moment. This time there'll be 103 homes alongside 2900m² of commercial space - all well and good for contributing to the area's economic and residential needs, but aesthetically dead compared to the grimy post-industrial Hackney Wick that's existed up until now. Some online digging swiftly reveals what's planned for other parts of this Olympic-side neighbourhood. The long wedge between White Post Lane and Wallis Road, currently McGrath Bros Waste Control Ltd, is ultimately destined to become another 54 residential units, plus 630m² of retail space and 221m² of studio space. The site opposite Mr Bagels, behind the bus stop on Hepscott Road, has already been knocked down and is destined for flats. The former Lea Tavern site is pencilled in for "a contemporary interpretation of the adjacent warehouse vernacular", for which read "glass monstrosity which looks nothing like what was here before". And then, blimey, there's the enormous bit around the station. 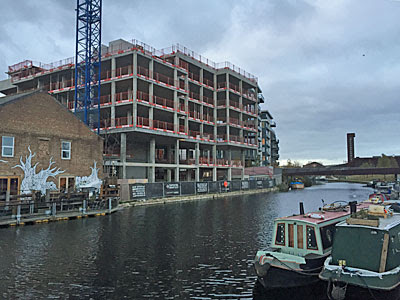 Hackney Wick Central is a significant redevelopment scheme covering six hectares on either side of the railway line, including many of the creative industries that currently give Hackney Wick its buzz. The affected zone runs from the edge of Leabank Square in the north to White Post Lane in the south, and east all the way down to the edge of the river. 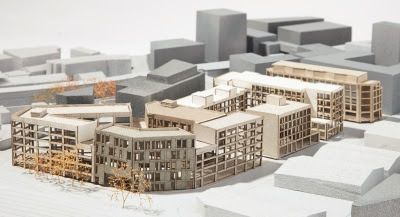 All the listed buildings in the target zone will be retained, and there are several, but the remainder of the less distinguished warehouses and studios will be knocked down so that a brand new mixed use neighbourhood can be created. Commercially it's a far better use of space, but the chances of the area's long-term vibrancy surviving within these sanitised ground floor units must be small. A new pedestrianised north-south spine road will be cut through, leading to an upgraded (and more central), station. A new retail centre will be established, with sufficient shops to support residents from existing local neighbourhoods and local neighbourhoods yet-to-be. It's proposed that the much-graffitied long-closed Lord Napier is brought back into use as a public house, so that's a plus. The Eton Mission boathouse will also survive, its facilities for rowing unmolested, at the heart of a new public space faced by cafes and restaurants. But expect much of the riverside to be turned into apartments, because waterside is where the real money is, as a walk south along this stretch of the Lea increasingly proves. The Omega Works has stood at the end of the Hertford Canal for some years, but developers are now squeezing in another block of 35 designer apartments called Carpenters Wharf on the other side of the new footbridge. There aren't enough bridges across the Lea, apparently, so the artistic community at Vittoria Wharf are due to see their buildings demolished to make way for another - who'd not be angry? Construction on the primary school across the river has just begun, as Sweetwater neighbourhood starts to take shape, and the footpath behind the Big Breakfast cottage has recently been sealed off. Fish Island Village is scheduled to arise unimaginatively alongside the Hertford Union from 2018, which means considerably more of the same. 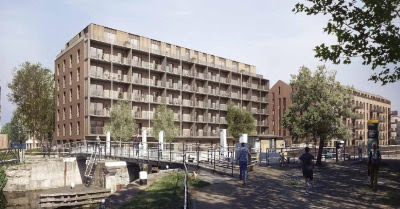 And then there's the waterside overlooking Old Ford Lock, empty since being used by Formans for hospitality in 2012, now boarded off and due to be reborn as this ugly bulkhead. We've always known that the aftermath of the Olympics would be a developmental whirlwind, indeed that was the original intention. But commercial pressure is now proving unstoppable outside the borders of the original park, as Hackney Wick inexorably succumbs to widespread gentrification. We'll gain more thousands more boxes in which to live, all urgently required, and ideally located to meet public need. But this corner of East London will lose the vibrancy that once made the place special, as characterful spaces are replaced by a blander more tedious landscape, which because it's the late 2010s means "gridded brick" all over. If you get to move in, congratulations. But if the rest of us decide not to visit this hackneyed landscape any more, don't be surprised.